Ewer-shaped Mini Vase - Forget-Me-Nots Discounts Apply ! A lovely ewer-shaped mini vase with forget-me-nots on the front and back. On the fron is a bow and it has a collar ridge at mid-neck. There is sponged gold at the mouth, the base, the bow, th body, and the graceful handle. 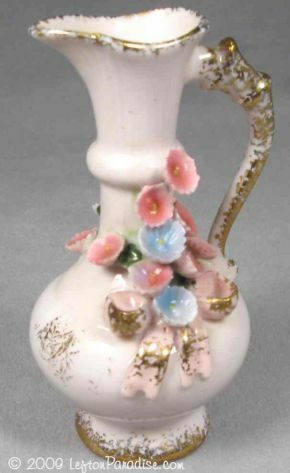 This flawless vase is 3¾ inches tall, has a color crown and a Made-In-Japan Lefton sticker.